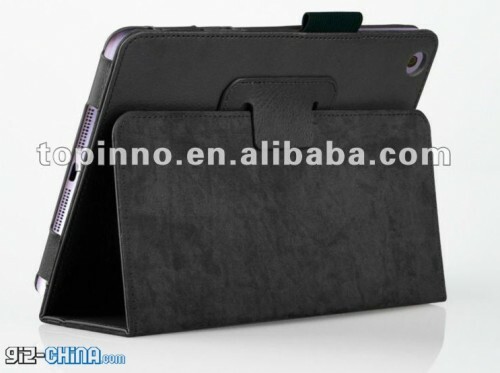 GizChina points to several case designs for the upcoming 7.85" iPad Mini. The new smaller iPad has been rumored to be launched later this year. The most recent rumors have suggested the new device will look closer to a large iPod touch, than a smaller iPad. Specifically, the side bezels are expected to be narrower as shown in the previous rendering. Some case manufacturers seem to be taking similar dimensions into account with new case designs intended for the 7.85" iPad. As shown here, the side-bezels are much narrower than the top and bottom. The case designs also show off the Facetime Camera and a hole for the rear camera. 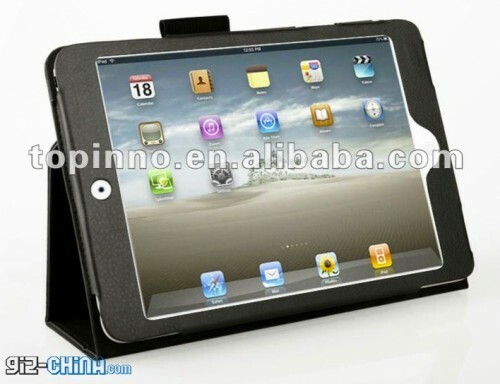 The iPad depicted within the case shows the new smaller dock connector, but those device images tend to be rendered mockups based on circulating expectations. In the past, the case designs themselves have been sourced from leaked/stolen specifications of the upcoming Apple device. Other images show the usual microphone opening at the top of the device, though there is also an extra upper-back opening, the purpose of which isn't clear. I'm still having trouble believing this is happening to be honest. It's quite interesting that Apple (if the product is even released) has allowed the bezel to be that slim, because when you imagine holding it, your thumb would likely cover the edge of the screen. I'm guessing that this is their way to, if you like, differentiate the iPad Mini as a more e-reading friendly/mobile device from the original iPad, because that bezel and design for the speaker grill/dock connector is almost identical to the new iPhone. The bezel size depends on the size/weight of the thing. the iPhone bezel is quite small. That's because you don't need your thumb to brace the device. So, a large bezel isn't automatically necessary -- it depends on the device heft. does the world really need a smaller iPad? Sure Apple tell us every year what we actually want....but im not sure we need this. Im sure they will sell really well initially, but im pretty sure after a good run of sales, the full size iPad eat up all the sales. Its a stupid product. Why design a tablet, tell the world how mazing everything is this size in your hand, then later on say, actually we can do it smaller too..
Its still too big to fit in a pocket, or too big to be a phone+, so whats the point in it exactly? People with smaller hands lol? This is exactly why you're not on Apple's product design team. Obviously there are a ton of people who want an e-reader sized device. You're views are not the same as the other millions of Apple consumers. I have an iPad. I took it on vacation out to SDG and Comic Con. It was great for having at the hotel, airport and at my friends house. It was not so great for sight seeing, taking around and actually at Comic Con. Just too bulky for on the go and you need a backpack or case for it. The mini would fit in your cargo pants pocket or a womans purse, etc. The whole time, I actually was like 'man...I hope they come out with that mini-ipad' because it would be great for things like I just did. There is a market for it. Really. Perfect size for a woman's handbag though, current iPad too big for most... That's a pretty big market. I'm going to jump in front of a bus. Average bus speed in London is 7mph, you may get some slight grazing. "iPad mini?...pah! not going to happen!" Maybe this is the new iPhone. All those people who want an absurdly large-screened phone will be thrilled.